LET'S EACH ONE OF US MAKE ONE LAST EFFORT TO GET ONE MORE TEAM! We are "shooting" for 100 participants in this event on January 30 at 9am. Please pass this along to anyone interested. 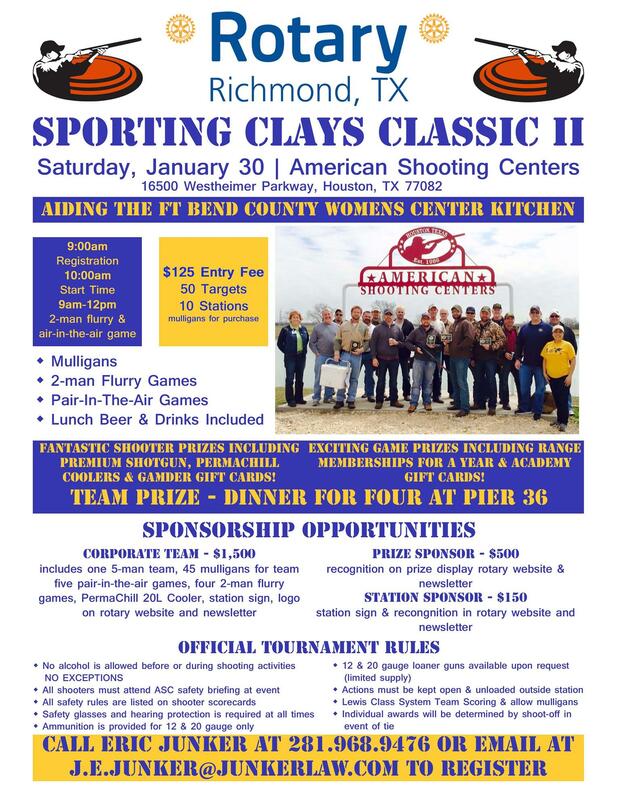 Forward the Clay Shoot sponsorship packet to all you know. Change your FaceBook cover page to promote our event. Go to our Rotary Richmond, TX FB page and like our page and our event. Promote Rotary Richmond, TX to all your friends, colleagues and business associates. Any questions, please contact Eric Junker, (281) 968-9476 or email: j.e.junker@junkerlaw.com.